The researchers, Wei Gao, Aysegul Uygun, and Joseph Wang from the University of California, San Diego, have published their study on the hydrogen-bubble-propelled microrockets in a recent issue of the Journal of the American Chemical Society. The microrockets are in the shape of tiny tubes, measuring about 10 micrometers long with diameters varying from 2 to 5 micrometers. The researchers fabricated the tubes out of the common polymer polyaniline (PANI) in templates, and then electrodeposited a thin layer of zinc on the inner surface. 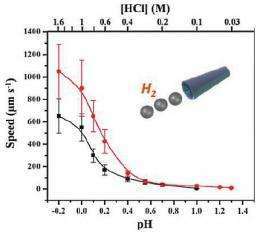 When the microrockets are immersed in any highly acidic solution, the zinc loses electrons and  due to having a more negative redox potential than hydrogen  promotes the production of hydrogen bubbles. The researchers experimented with using other metals, such as iron and lead, but they did not produce as many bubbles as zinc. Tests showed that the microrockets speed increases as the pH of the solution decreases. 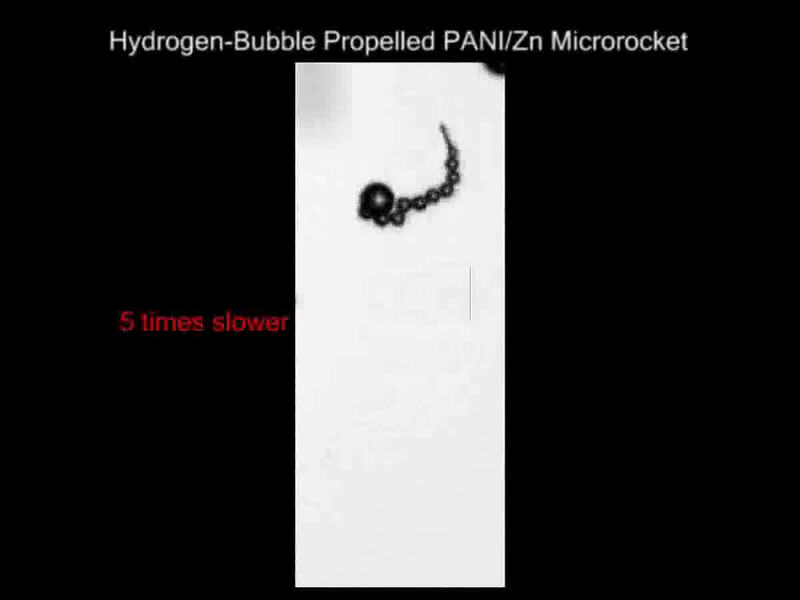 The fastest speed of 1,050 micrometers per second (equivalent to about 100 body lengths per second) was achieved by a 5-micrometer-diameter microrocket at a pH of -0.2. The speed decreased to about 10 micrometers per second at a pH of 1.3. Although the microckets have a limited pH range, the researchers noted that they could be useful in the stomach, which has a pH range of 0.8-2.0, as well as in some types of human serum. Tests also showed that the lifetime of the microrockets can vary from 10 seconds to 2 minutes, depending on the rate of zinc dissolution. The more zinc the rocket has, and the higher the pH of the solution, the longer the microrockets lifetime. While the microrockets can move autonomously in this way, the researchers also showed that its possible to control their direction and even to make them pick up and release cargo. 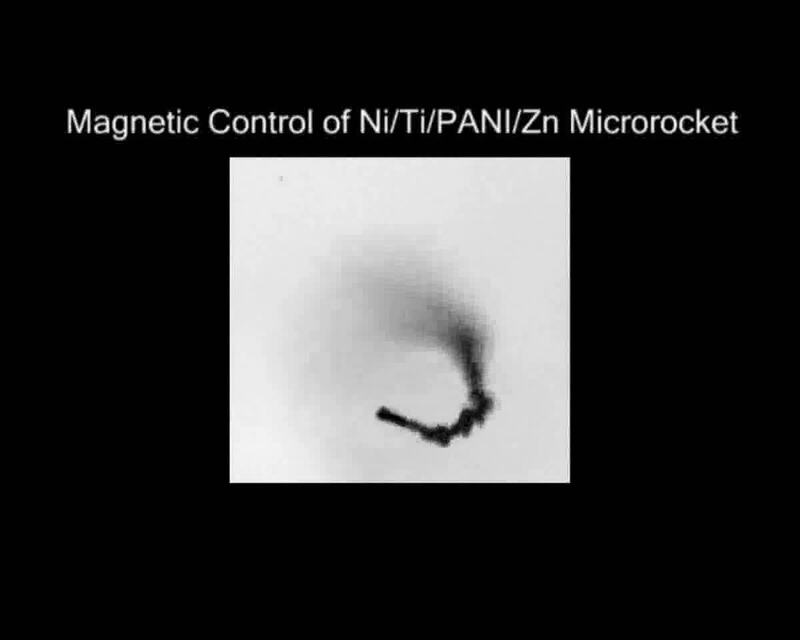 The scientists did this by depositing a magnetic layer on the microckets outer surface, and then magnetically guiding the device in the preferred direction. 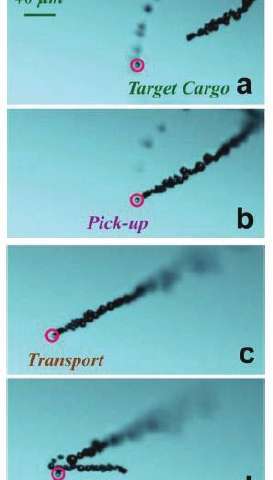 They showed that a microcket could magnetically capture a polystyrene cargo, transport it on a predetermined path, and then release it by rapidly changing the magnetic field direction. The scientists predict that this capability could prove especially useful for a variety of biomedical applications as well as monitoring industrial processes such as semiconductor processing. In addition, because the microrockets speed is directly related to the solutions pH, the devices could be used for sensitive pH sensing, such as detecting changes in stomach acidity. With its biggest advantage of being fueled by its acidic environment, without the need for additional fuel, the microrockets could further expand the scope of micromotor applications in many directions.